8/2/2017–CONCORD, NC–C/Amn Christopher Clark was one of three cadets from NC-111 to get hands-on experience on Saturday, 29 July 2017, during orientation flights at the Concord Regional Airport. “We will reintroduce the cadets to flight controls and basic aerodynamics in our orientation flights today, we will also be demonstrating basic search maneuvers such as a parallel search track and other search and rescue profiles we use,” Capt Moore explained. “They get exposed to these principles not only at their local squadrons but also here in the aircraft.” Capt Moore said that hundreds of cadets are able to participate in the CAP O-flight program every year and it was his privilege to offer such an experience to cadets. Today’s flight was Cadet Clark’s second “O-Ride” since joining CAP and he said that orientation flights give him valuable experience moving forward. “CAP is going to help me in the military,” Cadet Clark said. “And these orientation flights will help me understand planes and how they work,” the 8th grader from Alexander Graham Middle school added. “I want to finish college and become an Air Force pilot flying the PJ’s (the Air Force Pararescue Jumpers) for the Air Force Special Operations Command, Cadet Clark went on to say. C/Amn Thomas Mooney, a rising 10th grader who attends Charlotte Catholic High School, said he didn’t know which branch of service or military occupational specialty he intends to choose just yet but knows he wants to be involved, at some level, with aviation. 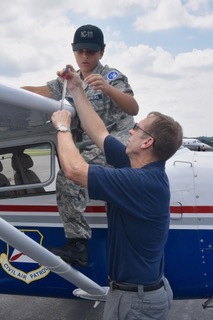 Capt Moore also walked the cadets through the in-and-outs of a Cessna 182T preflight check. Capt Moore showed the cadets various parts of the airplane during their preflight walk-around including the elevator, rudders and ailerons as well as how to check for proper fuel and engine oil levels. After completing the preflight walk-around, cadets strapped in and took a flight around Charlotte and the local area, viewing the countryside from 3,500 feet. The cadets were also warned to be on the lookout for other aircraft and birds and to serve as Capt Moore’s eyes and ears. C/Amn Jessica Dickerson, a rising 10th grader from the Woodlawn School in Mooresville, was on one of the first O-flights of the day, and her first flight since joining CAP about a month ago. She first learned about CAP from several of her friends. She wants to learn more about aviation and aerospace and said that she thought CAP could offer that experience. Although she felt a little airsick due to nerves, she really enjoyed the turns and the final approach.